The $16 bln French telco has offered $15 bln for 57 pct of the No. 4 U.S. mobile operator. That’s bold, with financing not immediately to hand and the claimed premium reliant on improbable synergies. But the intervention may intensify antitrust objections to Sprint’s rival offer. Iliad said on July 31 that it has offered to pay $33 a share for 56.6 percent of T-Mobile US, a total of $15 billion. The French telecoms operator has a market capitalization of $16 billion. Iliad says the cash will come from raising debt and $2 billion of equity. The company’s founder, Xavier Niel, would participate in the capital increase. Iliad said that, after allowing for the value of its anticipated synergies, the deal was worth about $40.50 a share to owners of the other 43.4 percent of T-Mobile US, or some $36.20 a share on average for the whole company, which Iliad said was a 43 percent premium over the company’s share price on Dec. 12, 2013, before rumors emerged of Sprint’s interest. The French group said it anticipated $10 billion of synergy value, without clearly defining the figure. According to a Breakingviews analysis of the per-share values given by Iliad, it may refer to a pre-tax present value before tax at an assumed 40 percent rate. One way to arrive at that number would be to assume $1 billion of annual pre-tax synergies capitalized at a multiple of 10. Japan’s SoftBank, which controls No. 3 U.S. carrier Sprint, had agreed in principle to a deal to buy No. 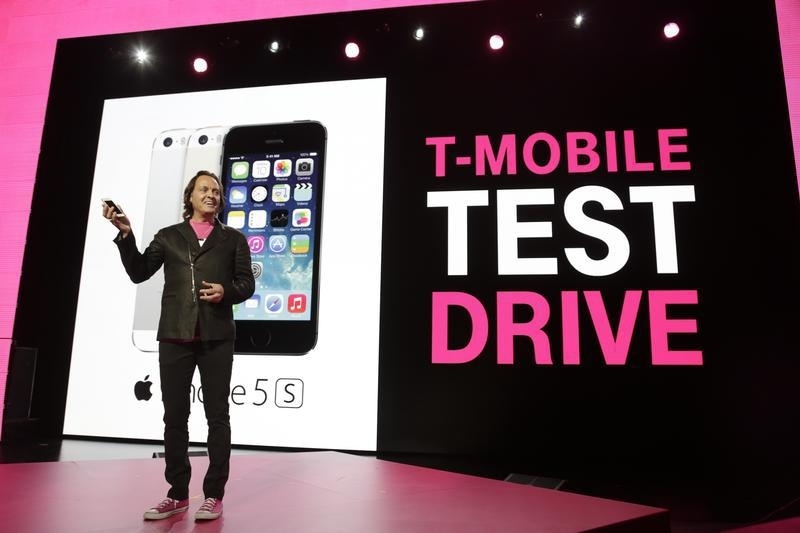 4-ranked T-Mobile US for about $32 billion, or roughly $40 a share. Regulators have warned Sprint not to proceed with a deal for antitrust reasons. “The mobile business is today, with four carriers, a competitive business, and it’s important it stays that way,” Tom Wheeler, chairman of the U.S. Federal Communications Commission, said in December. Regulators in 2011 forced then No. 1 cellphone operator AT&T to walk away from a $39 billion deal to buy T-Mobile US.